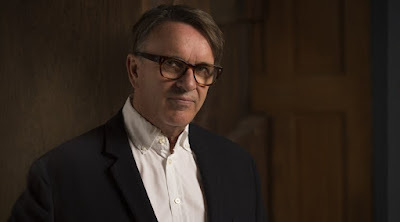 Discussions Magazine Music Blog: CHRIS DIFFORD/Chris To The Mill (box set) reviewed! CHRIS DIFFORD/Chris To The Mill (box set) reviewed! Chris Difford is primarily known as a songwriter – one half of the critically acclaimed songwriting duo Difford & Tilbrook – as well as being a member of veteran British popsters Squeeze. 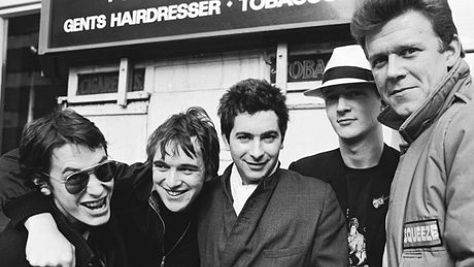 On Squeeze’s records, the words may be Chris’ but most of the lead vocals are handled by Difford’s partner-in-crime Glenn Tilbrook. However, one of the band’s first hits was “Cool For Cats,” which featured Chris on lead vocals. At that point in the band’s career, Chris was primarily the low, croaky voice that blended well in harmony with Glenn’s sweet tenor warblings. But let’s be honest: on the first three Squeeze albums – SQUEEZE (1978), COOL FOR CATS (1979), and ARGYBARGY (1980), – Chris’ vocal contributions were not unlike Ringo’s obligatory solo spots on Beatles albums. In fact, “Cool For Cats” is to Squeeze what “Yellow Submarine” is to the Beatles – a nice quasi-novelty tune that doesn’t really represent the bulk of the band’s catalog. However, when EAST SIDE STORY was released, things changed. Chris began to sing in a wistful, breathy voice that surprised even the band’s most ardent fans. Sure, he still slipped into his lower register for those classic Difford & Tilbrook dual harmonies but, for his solo turns, he was a more confident and much stronger lead vocalist. When the songwriting partnership – and Squeeze – split up at the end of 1999, all eyes turned to Tilbrook’s solo career. He was the band’s engaging front man so expectations were high and the pressure was all on him. However, as Edsel Records’ 2017 five-disc (4 CDs + DVD) box set CHRIS TO THE MILL proves, Difford’s solo career was every bit as fantastic as Tilbrook’s. So, if you missed it the first time around, you can now enjoy it all in one place. CHRIS TO THE MILL contains three solo albums – I DIDN’T GET WHERE I AM (2003), THE LAST TEMPATION OF CHRIS (2008) and CASHMERE IF YOU CAN (2011) – including plenty of bonus tracks plus a bonus DVD. A perfect release for those that may have missed these solo albums, this is pretty much every original song released during the long Squeeze hiatus. The only album that is missing from this box is SOUTH EAST SIDE STORY, an album of Squeeze covers performed by Difford and his solo band. Since you already know those songs, it’s time for you to meet the modern Chris Difford – a man coming to grips with getting older and leaving his youth behind. As he tries to find some kind of peace in this world, he is still discovering new things about himself and the human condition. It can be uncomfortable at times but his willingness to be forthright and honest is a breath of fresh air… especially when many of his contemporaries, past and present, tend to pander to a younger audience. While these albums may be a few years old, they offer so much insight to a songwriter that many of us grew up with. While attention was diverted elsewhere (i.e. : Tilbrook’s solo career), Chris Difford combined forces with former It Bites main man Francis Dunnery and released the hauntingly wonderful I DIDN’T GET WHERE I AM album in 2003. Difford seems completely at ease surrounded by Dunnery’s musical magic. At times, it does sound more like a Dunnery solo album than a Difford album but Chris is certainly the star here. There are so many great moments to absorb on the album. The lead track, “Tight Rope,” initially starts the album on a sparse note, eventually revealing many more musical layers as the song unfolds. In fact, by the end of “Tight Rope,” you can already sense the album is going to be both adventurous and revealing. And, indeed it is. Whether he is singing from experience or playing the part of an observer doesn’t matter – Difford is, as I stated before, honest. He can go from witty to heartbreaking in just a few lines. With Dunnery’s emotional musical backdrop, this is an album that may take a few spins to sink it, but it is well worth every moment. Disc One of the box contains I DIDN’T GET WHERE I AM while Disc Two features an additional nine tracks taken from this period including demos, alternate versions and more. THE LAST TEMPTATION OF CHRIS is closer to what people may have expected from a solo album by a former Squeeze member: jaunty, instantly hummable and chock full of fab tunes. With veteran singer/songwriter Boo Hewerdine taking over from Tilbrook and Dunnery as Chris’ main collaborator, the album is not unlike Hewerdine’s work with The Bible. Mixing a love of ‘60s Pop and British Folk, this is a playful album that moves away from the haunting feel of the previous album into a more relaxed and hopeful musical universe. “Come On Down,” “On My Own I’m Never Bored,” and “Fat As A Fiddle” are standouts and should be firm favorites for all Squeeze, Difford and Hewerdine fans. Disc Three of the box includes the full album plus an additional seven bonus tracks including non-album cuts, demos and more. CASHMERE IF YOU CAN begins where LAST TEMPTATION… left off. Kind of. CASHMERE blends the buoyant sound of LAST TEMPTATION with and edgier vibe. Roughly half the album was co-written with Hewerdine while the remainder of the songs were composed with the album’s producer Leo Abrahams. According to the liner notes of the box, Difford himself may not be completely happy with the album, yet it is an absolute treat for music fans. Opener “1975” has a Glam-inspired stomp and finds the modern Difford reminiscing about his formative years. “Like I Did” finds the songwriter comparing his offspring’s behavior to his younger self. In fact, the album finds Difford even more comfortable in his solo skin than ever before. It blurs the lines between then and now. There’s acceptance instead of reluctance. And it is classic Difford from top to bottom. Disc Four includes the full album plus five bonus tracks including Boo Hewerdine’s demos of four of their co-writes. Disc Five is a DVD that features Chris discussing the stories behind some of the songs as well as acoustic performances of four of them. So, in a nutshell (well, a clamshell box), this is an essential purchase. Really. NOTE: Chris is now back with Squeeze, who are just about to release their album THE KNOWLEDGE. He has also just released his autobiography entitled SOME FANTASTIC PLACE: MY LIFE IN AND OUT OF SQUEEZE.